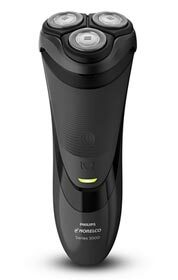 The Philips Norelco 2100 shaver continues the trend of shavers that offer decent performance at a low cost. While Panasonic and Braun are the undisputed kings of budget-friendly foil shavers, Norelco is pretty much the only big player in the rotary razors game. A bestseller in its category, the 2100 (S1560/81) replaces the older 6948XL/41 razor and brings along a few improvements of its own. Read along for our full Philips Norelco 2100 review where we put the shaver through its paces and find out if it’s the right one for you. Wrapup — Who should buy the Norelco 2100? The 2100 (S1560/81) is an entry-level product from Norelco’s current line of electric shavers and has just the right amount of features for a basic, no frills razor that will get the job done. 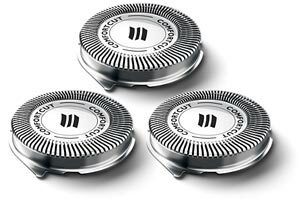 The shaving unit is made up of three cutting heads that can flex independently and feature self-sharpening blades. The razor can only be operated cordless and is fitted with a Li-Ion battery. The front side also features a battery full, battery low and charging indicator. A very pleasant surprise is the presence of an integrated pop-up trimmer that works quite well for minor grooming and trimming. Other more expensive razors (like the 6100) only come with a click on trimmer, so props to Norelco for including it. Finally, the shaver is only suitable for dry shaving, even though it can be safely rinsed with water for cleaning. If you plan on using your razor in the shower or with shaving cream, you’ll have to opt for an Aquatec model. There’s no travel lock present on the Norelco 2100 and you won’t get a travel pouch as well, but that’s to be expected for a razor in this price range. 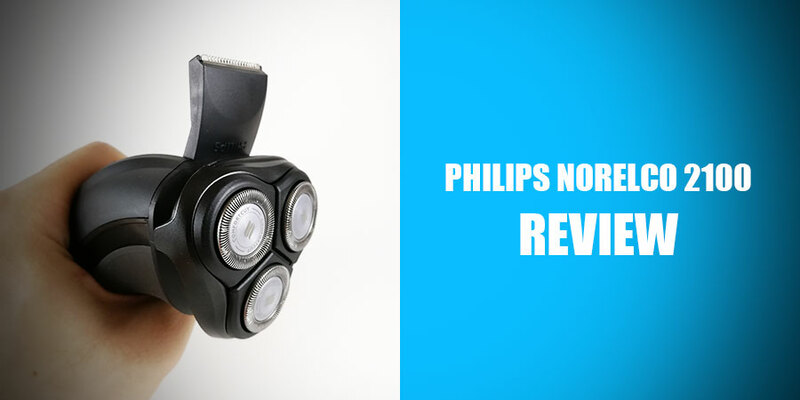 The design of the 2100 is classic Philips Norelco, with the familiar ergonomic shape and triple shaving head. With a black color scheme and a dash of blue, it looks quite nice and definitely not as stark as its predecessor. The razor feels very light and compact in the hand, while the rubber insert on the front provides a very secure grip. Despite its low price, the build quality seems very good and has a durable and solid feel. 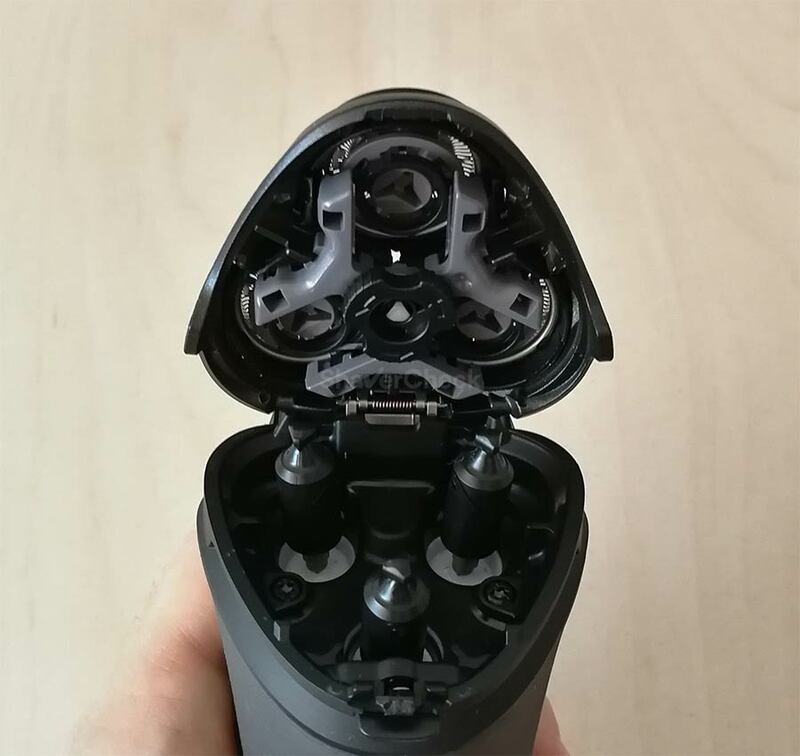 Some may associate the low weight and hollow feeling of the shaver with poor build quality, but I didn’t feel that was the case here. Overall, very decent build quality for the price. As mentioned previously, the Norelco Shaver 2100 can only be operated cordless and comes with a Li-Ion battery that provides up to 35 minutes of shaving time when fully charged. Regarding the charging, it takes a whopping 8 hours. Long charging time is still one of the main drawbacks of some Norelco budget shavers, as we’ve seen in the case of the 3500 that we reviewed in the past. This wouldn’t be such a big deal if the shaver could also be used while charging, but with the 2100 that’s not possible. And this is very odd as in general dry only models can be used in this manner. The charging cord plugs directly into the shaver as there is no charging stand included. On the front of the razor there is a charging indicator that signals battery low (light blinks orange) and battery full (lights up green continuously). Also, there is no quick charge option, which is another bummer. As it was expected in the case of an inexpensive razor, you won’t get a cleaning station. And that’s ok, as the 2100 is very easy to clean. After completing your shave, just rinse the razor head under hot tap water. After that, press the release button located on the back of the shaver to pop open the shaving unit. Dump the hairs and rinse with hot water the inside of the chamber and the cutters, pat dry with a cloth and leave it open to fully dry. The above operation must be performed after every use. Every once in a while, a more thorough cleaning procedure must be carried out. This involves removing and cleaning individually the three cutters. It is a rather fiddly operation that takes more time and must be done carefully, cleaning only one cutter at a time as the combs and blades are matching pairs and must not be mixed. Please refer to the shaver’s user manual for a detailed overview of this operation. And now let’s get to the most important part of our Philips Norelco 2100 review, the actual shaving performance. As you probably already know by now, the 2100 is only suitable to be used for dry shaving, so the performance section of this review will only refer to that use case. Even though the lack of wet shaving capabilities can be considered a minus, you know exactly what you’re getting with this particular razor. Regarding the shaving experience itself, the 2100 was quite a pleasant surprise. While it won’t shave as close and as fast as other more expensive Norelco shavers, it does a decent job. Using it daily or even every two to three days will yield good results. The jawline and neck areas are always more difficult to tackle for any shaver, so additional passes may be required here. As far as comfort goes, the Norelco 2100 proved to be again a surprisingly good razor for its category. 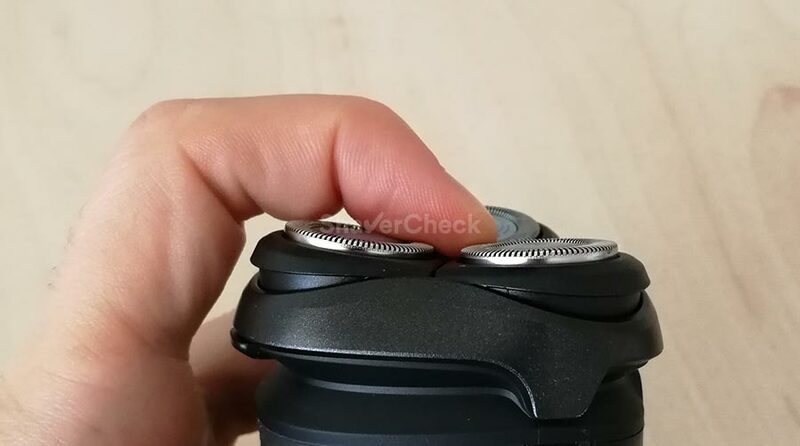 Provided the battery is properly charged and the cutters are in good condition, you shouldn’t experience any major skin irritation or hair pulling. Don’t expect however the comfort you’ll get from something like the Philips S9000 Prestige for example. As it was to be expected from a rotary shaver, the noise is kept to a minimum during use. The light weight of the razor, along with the comfortable and smooth operation really make for a surprisingly pleasant shaving experience. The integrated pop-up trimmer is useful and practical as well, even though it doesn’t cut as efficiently as other trimmers. The positioning is great and the head of the shaver doesn’t get in your way. Again, it’s a really nice addition for a shaver in this price range. The Norelco 2100 uses the SH30 Replacement Head that should be changed once every year. The price used to be very high, almost matching the price of a new 2100 shaver. It has however dropped significantly and can now be bough for a reasonable amount of money. Anyone looking for an inexpensive rotary razor for dry shaving only should consider the Norelco 2100 as its performance will be good enough for most users, especially when used for daily shaving. Having said that, if you do require very close shaves you might want to up your budget and look for a more capable shaver. 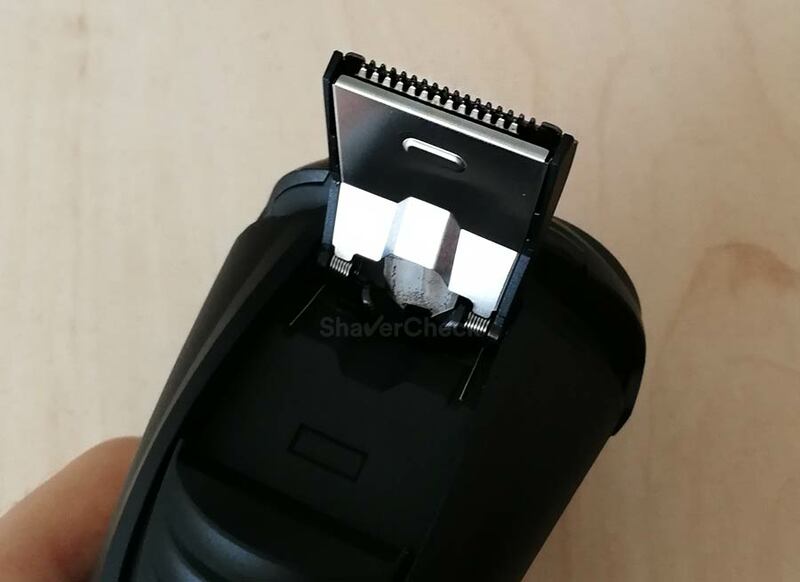 You must be aware of the shaver’s main drawbacks, which are, in my opinion, the average battery life, the long charging time and the lack of a quick charge option. A very low price seems very appealing at first, but you must carefully analyze what you’re really getting in return. I personally think that there are too many compromises made in order to keep the purchase price low. And these compromises add up to the point where a low initial investment is simply not enough. There are better options for a slightly higher price as we’ll see in the next section. 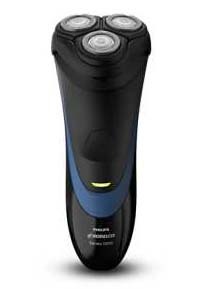 The Philips Norelco Shaver 3100 addresses pretty much all the shortcomings of the 2100. For a few dollars more, you’ll get a shaver with better battery life (45 minutes) and it can be also used while charging. Charging still takes between 6 and 8 hours, but at least you’ll be able to shave with the cord plugged in. The 3100 is also suitable for dry only use, but if you want a wet/dry shaver you should check out the Philips Norelco 3500. This shaver only takes one hour to fully charge and also features a quick charge option. Thank you, John. Glad you found the review useful. is it ok to use the 2100 on my head? Yes, it should be fine for shaving your head as well. Thanks. I tried it and it works great.